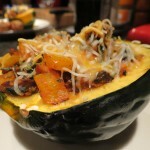 Butternut squash is a fall staple, but when I got one in the farm share a few weeks ago, I decided to try something new. I found a recipe on the Weight Watchers website for Cheese Ravioli with Butternut Squash Sauce so I decided to give it a try. 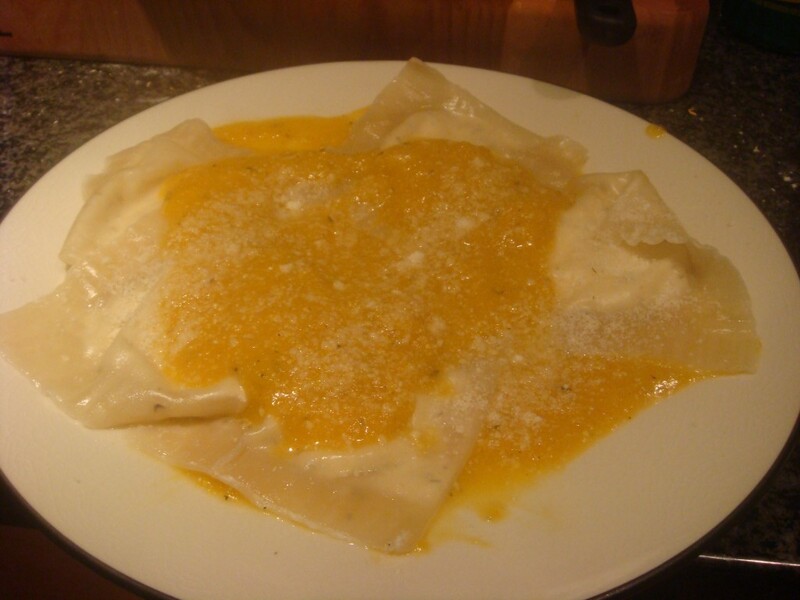 Everyone has heard of butternut squash ravioli, but I’ve never thought to use it as the sauce itself. This recipe called out to me because I had some egg roll wrappers in the fridge and the recipe used them as the pasta in the dish. 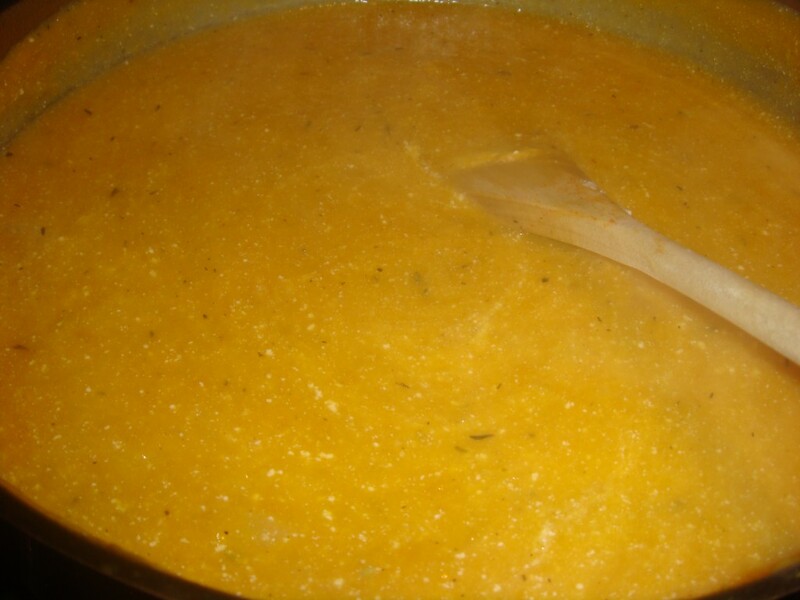 Butternut squash sauce– delicious and really different! In the future use the sauce with fresh ravioli (maybe my basil ravioli) or frozen tortellini. So tonight, not really in the mood to cook a full meal, I decided to put the butternut squash sauce on frozen tortellini… it was much more delicious. The sauce held up remarkably well and is delicious enough to warrant a post here. Making the sauce itself is pretty easy. In a high sided skillet saute garlic and onion in the olive oil. 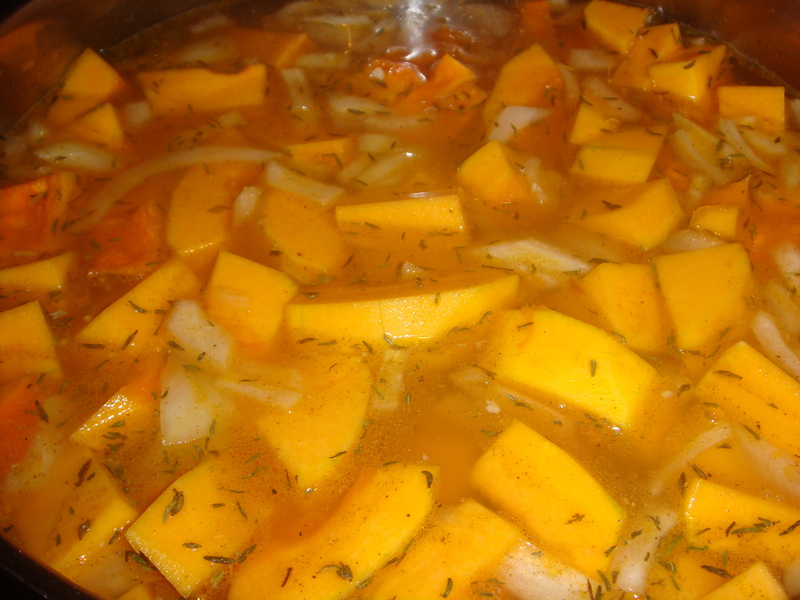 Once the onions have gotten a little caramelized, add the squash, broth, thyme, sage, black and cayenne pepper, and nutmeg. 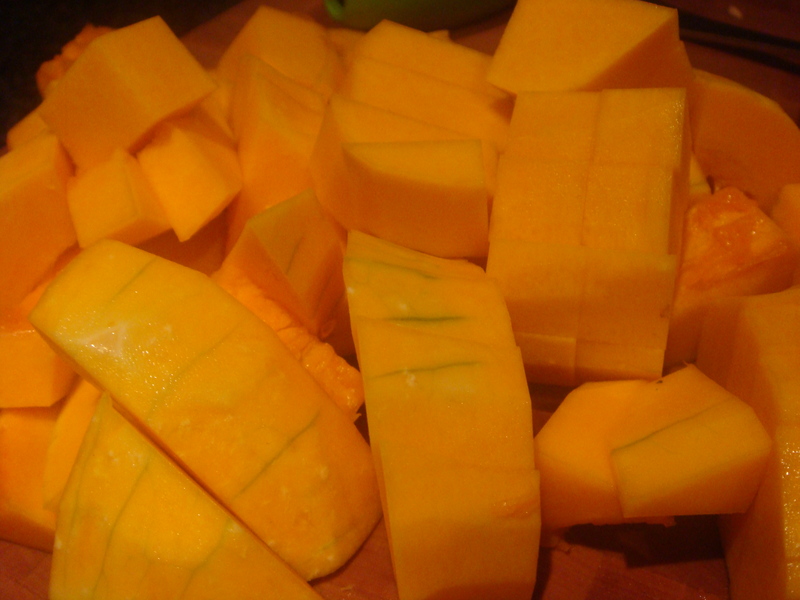 Bring the mixture up to a boil and cook about 15 minutes until the squash has gotten tender. Turn off the heat. Using an immersion blender puree the mixture to desired consistency and stir in ricotta cheese. If you don’t have an immersion blender… well, you should definite buy one. This is the one I have and it’s awesome because it’s super versatile for making sauces and I love the little mini chopper attachment. But I digress… if you don’t have an immersion blender you could also use a food processor or a regular blender. And that is pretty much it. It makes a lot of sauce but it keeps really well and is delicious. I highly recommend it with a ravioli or tortellini that you like (simple cheese filling is probably best since the sauce has a nice complex flavor). As for the Parmesan cheese, just sprinkle it on top of whatever final dish you prepare.